Since 2010 seven people have been killed by tigers in the vicinity of Sunderkhal in Uttarakhand, northern India. Another was killed in the same area by a leopard. The most recent death occurred in March 2014. For the Sunderkhal villagers who have lost loved ones, each death is a tragedy. For World Land Trust (WLT) and its partner in India, Wildlife Trust of India (WTI), each death is a vivid reminder of the urgent need to keep both humans and big cats safe. That’s why during Big Cat Big Match Fortnight (1-15 October 2014), WLT will be raising funds specifically to help protect Chilkiya-Kota Corridor. During the first two weeks of October, all donations to WLT’s Big Cat Appeal will be matched with funds pledged in advance. 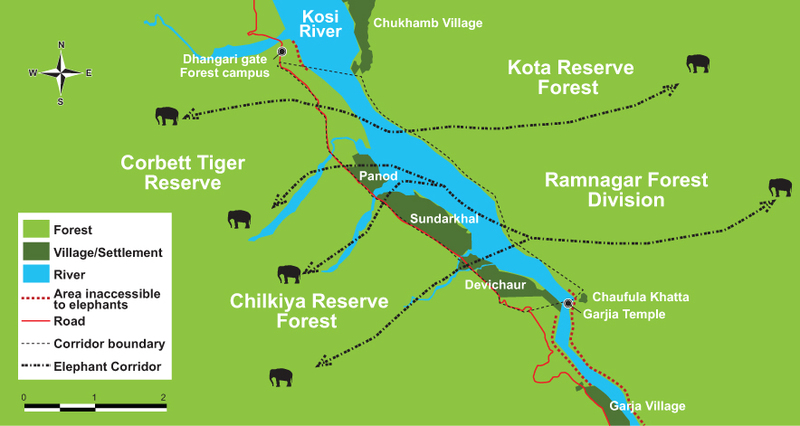 WLT and WTI propose to minimise human-wildlife conflict by protecting Chilkiya-Kota (Sunderkhal) Corridor, a traditional wildlife route between Corbett Tiger Reserve and Ramnagar Forest Division. 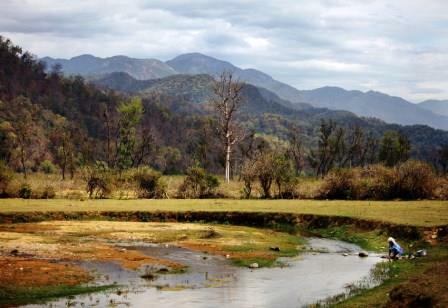 The corridor is the most important migration path for tigers, elephants and other wild animals between the two forests of the Corbett Tiger Reserve and Ramnagar. WTI staff estimate that some five or six tigers regularly use Chilkiya-Kota corridor, basing the number on tiger monitoring information and discussion with forest officials and others working in the area. Tiger pug mark in an elephant footprint recorded in Sunderkhal. © WTI. Currently, much of this 3.75km wide corridor has been occupied by migrants from Almorah, Garwal and Nainital, many of them work in nearby hotels and resorts. They have settled on the banks of Kosi River, at the heart of the corridor, which makes the situation even more alarming. Despite this steady increase in people in the area, wildlife continues to use the corridor. The result? 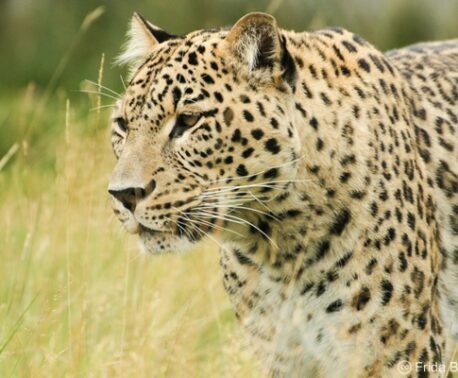 People are losing their lives and cattle are being killed by tigers and leopards. In January 2011, one adult male tiger, declared a man eater, was shot dead in the corridor area by officials from the Uttarakhand Forest Department. To secure Chilkiya-Kota Corridor, WTI is collaborating with Uttarakhand Forest Department, in order to relocate the human settlement to a safer location with a phased approach. The villagers have wholeheartedly agreed to the relocation and in the new settlement will have their own houses and land ownership. 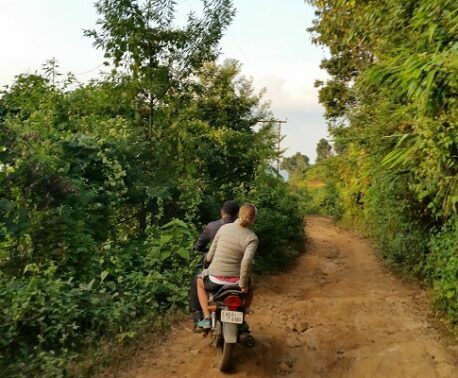 “To conserve the wildlife, especially elephants and tigers, as well as to ameliorate the suffering of people due to conflict with wildlife, rehabilitating the villagers to safer place is the only option. This will be a win win situation for both the villagers who are living in poor conditions and wildlife”, says Dr Sandeep Tiwari, WTI’s Deputy Director and Regional Head, Uttarakhand and Uttar Pradesh. Conflict tends to occur near villages on the fringes of forests, where cattle are easy prey for tigers. While hunting, if a tiger encounters a human, it may attack with sometimes fatal consequences. When that happens, “conservation suddenly becomes a heavy burden for the forest officials to bear on their shoulders,” says Jose Louies, WTI’s Regional Head (South India), in a recent account of a tiger conflict in Karnataka. India is home to the largest population of tigers in the wild: approximately 50% of the world’s population survives across 17 Indian states. A little over a century ago, there may have been as many as 37,500 Bengal Tigers in India. Today the estimated population of 1,500 tigers is just 4 per cent of that in the early 1900s. Poaching is a key cause in the tiger’s decline – both the hunting of the animals themselves and their prey. As numbers fall, genetic viability and the long term survival of the species becomes harder to sustain. Habitat destruction and fragmentation are other major reasons for this drastic decline in tiger population – and go a long way to explaining the rise in human-animal conflict. The image of a Bengal Tiger is © konmesa courtesy of shutterstock.com.